Take Grandview Road Exit (#266). Turn left on Grandview Road. Head west until you come to Blaine Road. Take a right. Follow the Blaine Road north to Alderson Road. Take a left. Heading west, drive to the bottom of the hill and at the stop sign take a right on to Birch Bay Drive. We are located right on the corner! Take Birch Bay Lynden Road Exit (#270). Turn right on Birch Bay Lynden Road. Head west until you come to Harborview Road. Take a left. At the bottom of the hill, take a left on to Birch Bay Drive. Head south approximately 2.5 miles. 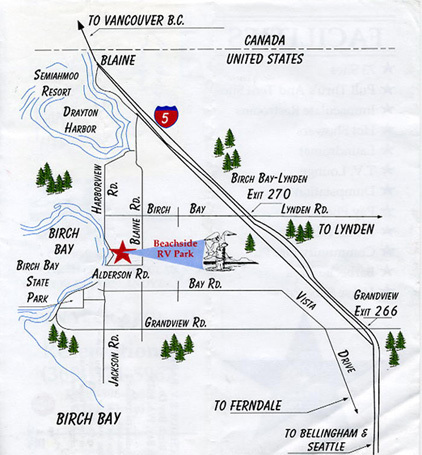 We are on the left at the corner of Birch Bay Drive and Alderson Road .